To the extent that it is possible to examine banding patterns of polytene chromosomes from different tissues of a single species, they appear to be the same (see ref. 198). In D. melanogaster, for example, detailed comparative analysis of polytene chromosomes of ovarian nurse cells and salivary glands revealed essentially identical banding patterns in those two very different tissues (see Chapter 6). Furthermore, blocks of the same chromomeric patterns can be recognized across species of Drosophila that diverged millions of years ago (199). Models of how and where bands are formed must be able to account for such intertissue constancy and evolutionary stability. In one of the first immunostaining experiments done on salivary gland poly-tene chromosomes, antibodies directed against a subunit of RNA polymerase II were found to stain interbands and puffs, but not bands (177). This, and earlier observations of 3H-uridine labeling of interbands (see ref. 204), indicated that interband regions are transcriptionally active (this was long known to be true of puffs). A current and widely held view is that puffs reflect high levels of gene expression, interbands correspond to genes expressed at lower levels (e.g., housekeeping genes), and bands are transcriptionally silent regions. Microarray technology now permits expression levels to be measured for each and every gene along a chromosome arm, so that a transcription profile for salivary gland cells may be compared against the polytene banding pattern. Preliminary results of this kind of experiment suggest, surprisingly, that a significant portion of the genome of Drosophila embryos and adults is expressed in blocks of 10-30 adjacent genes, with members of each block all being expressed at a similar level irrespective of gene function. However, no obvious correlation was found between such expression domains and polytene banding patterns (205). DuPraw and Rae in 1966 (206) proposed a "folded fiber" model of polytene chromosome structure in which unit chromatids were aligned and bands were posited to be regions of chromatid folding or coiling separated by regions of low DNA density, the interbands, in which chromatids were packaged as extended parallel fibers. A competing model, rooted in early observations of differential DNA representation (see Subheading 4.3. ), was that interbands were underreplicated relative to bands (see refs. 170,207,208; for criticisms of this model at the time, see ref. 190). Spierer and Spierer (209) settled this question using quantitative Southern blot hybridization to measure DNA levels across a contiguous 315-kb stretch of polytene region 87D5-E6 containing approx 13 chromomeric units (band and adjacent interband). They found no significant variation in the levels of DNA between bands and interbands, nor within the large (>160 kb) band at 87E1,2. Lifschytz (190) reached the same conclusion using a similar method but with probes from dispersed regions of the genome. Generalizing to all chromomeric units, these results showed there is a "monotonous polyteny" along the euchromatic arms, excluding chromosomal pinch points such as IH sites. A folded fiber model of the salivary gland polytene chromosome (206) is almost certainly correct: Chromatids are synapsed in register, bands are compact structures containing on average 10-20 times more DNA than interbands (176), and interbands are arrays of extended parallel fibers (see Subheading 4.2.). However, a detailed picture of polytene chromosome structure is still a matter for conjecture. For example, we know very little about how DNA is organized in bands or why bands form where they do. With the aim of provoking some thoughtful discussion on these topics, I propose here a possible explanation for the formation of bands that is based on the twin-domain model of transcription-induced supercoiling postulated by Liu and Wang (210). Their model asserts that as RNA polymerase transcribes a segment of duplex DNA—either a plasmid or a chromosomal loop anchored at its base—torsional strain exerted on the DNA causes positive (+) supercoils to form ahead of the polymerase complex and an equal number of negative (-) supercoils to accumulate in its wake (see Fig. 3A). The model also states that for supercoiling to occur, the translocating RNA polymerase must not rotate about the DNA helical axis—that the DNA rotates instead and its anchored ends prevent the generated twisting forces from diffusing away. There is considerable experimental support for the twin-domain model, and recent studies of transcription-induced plasmid supercoil-ing in Escherichia coli show that sequence-specific DNA-binding proteins can enhance supercoiling, apparently by forming barriers that impede diffusion and merging of adjacent (+) and (-) supercoil domains (211). Fig. 3. Twin-domain model of polytene chromosome banding. (A) Schematic representation of the torsional stresses on DNA generated during transcription of a gene. (+) indicates positive supercoils ahead of the RNA polymerase complex (oblong box) and (-) indicates negative supercoils in the wake of the complex. The vertical bars flanking the chromatin loop domain represent anchoring points (e.g., SARs) on the chromatid. The hypothetical gene that has just been transcribed is indicated below the coiled DNA, and the squares and circles covering the 5' end represent transcription factors bound to enhancers and other regulatory sequences. Z-DNA can form in regions of high (-) supercoiling. The limits of the marked band and interband regions are speculative. The supercoiling aspect of this figure was redrawn and modified from (210). (B) Topological domains may have more than one gene. Top: The tandem arrangement of genes A and B transcribed at similar levels causes the (+) and (-) supercoils generated in the intergenic region to annihilate each other, but supercoils would still accumulate in the flanking regions of the domain essentially as in panel A (see ref. 210). Bottom: Convergently transcribed genes C and D will accumulate high levels of positive supercoils in the intergenic region. The model predicts a band should form in this region, assuming topoisomerase activity is low and protein complexes in the adjacent interband regions prevent diffusion and merging of (+) and (-) supercoils. for example, might fulfill the roles of DNA loop anchors, as depicted by the vertical bars in Fig. 3A. Certain insulators/boundary elements might also have this capability; these are nucleoprotein complexes able to block the effects of a transcription enhancer element on a promoter when interposed between the two, which is how they are operationally defined (for reviews, see refs. 212-217). However, irrespective of whatever else a putative anchor might do, it must be able to prevent free rotation of DNA at the bases of a chromatin loop, otherwise it is not an anchor. With this assumption of chromosome loops in place, I propose that the bands of polytene chromosomes result from torsional stresses generated as a consequence of constitutive transcription (e.g., of housekeeping genes) in each chromatin loop. 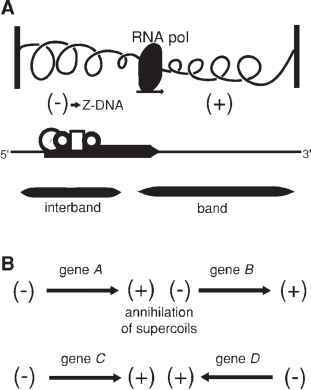 In the simplest case of a chromatin loop having just a single gene, (+) supercoils would form at the 3' side of the transcribed gene and (-) super-coils would form at the 5' side (see Fig. 3A). I further propose that the (+) and (-) supercoil domains would give rise to bands and interbands, respectively, to a first approximation [(-) supercoils might also be able to form bands under certain circumstances]. Transcription factors are expected to be associated with 5' regulatory elements and to possibly constrain the (-) supercoils there, whereas the 3' end of the gene (and nongenic regions) is likely to be relatively devoid of proteins (apart from histones and possibly some other packaging proteins). At sufficient levels of (-) supercoiling, DNA in its usual B conformation can be transformed into left-handed Z-DNA (218,219). It is therefore significant that antibodies against Z-DNA specifically stain interbands of poly-tene chromosomes (220,221). Conversion of (-) supercoils to Z-DNA and/or transcription factor binding to regulatory sequences could result in the extended parallel chromatin fibers seen as an interband. What about the (+) supercoils? They could be constrained by proteins like mammalian DEK, which induces (+) supercoiling upon binding SV40 nucleosomal DNA (222). Moreover, DEK proteins whether on the same or on different DNA molecules can interact with each other to form multimers. At high DEK : DNA ratios, chromatin becomes compacted into an irregular structure that is not fully superhelical (222). Perhaps polytene bands also are formed in this way. Different chromatin loops will, of course, contain different numbers and arrangements of genes, and this will have important consequences for the distribution of (+) and (-) supercoil domains in the loop. For example, for two genes in tandem and transcribed at similar levels, supercoils generated in the intergenic region will be of similar magnitude and opposite sign and therefore mutually annihilated (see Fig. 3B, top). However, the net result on supercoil-ing in the chromatin loop will be similar to that depicted in Fig. 3A. In contrast, (+) supercoils generated by convergently transcribed genes will amplify supercoiling (see Fig. 3B, bottom). With three of more genes in a chromatin loop, more complex interactions would occur (not shown). Other factors that can affect supercoiling are gene size and level of expression. Transcription of a large gene will induce more supercoiling than will a small gene expressed at a comparable level because of the greater twisting forces generated in transcribing a large gene. Localized activities of topoisomerases, able to relax (+) and (-) supercoils, and the effects of ATP-dependent chromatin remodeling complexes (e.g., SWI/SNF) (223) will also influence the degree of super-coiling. All of these factors will combine within each chromatin loop to ultimately determine the banding pattern of the chromosome. (In the absence of such information, I will refrain here from attempting to fit to the model the interesting observations of the Notch gene locus in band 3C7) (224,225). An attraction of this model is that it can explain the observed constancy of polytene chromosome banding patterns, both between different tissues of an organism and between different species of Drosophila where certain syntenic gene relationships have been maintained. Furthermore, because genomic context determines banding in this model, it can explain the observation that the same transgene construct inserted at different chromosomal sites can form a band, an interband, or a puff (226).